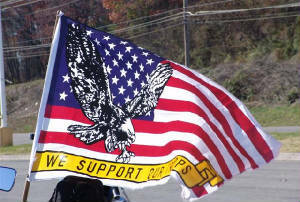 Photo by East TN Patriot Riders. Tuesday, November 25th marks two years since a roadside bomb exploded in Iraq and killed Staff Sergeant Daniel Morris of Clinton. 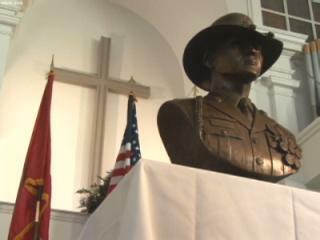 Sunday, the 23rd, his hometown unveiled a bronze bust that serves as a permanent reminder of his sacrifice. The bust was donated by "Operation Never Forget," which was founded by families and friends of those killed in Iraq and Afghanistan. 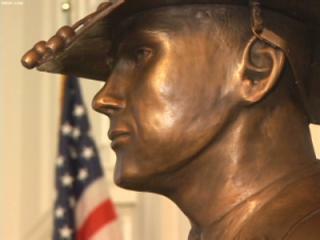 The bust will be placed on permanent display at the courthouse in Clinton. 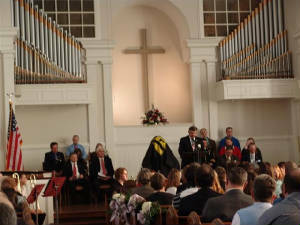 It was unveiled Sunday during an afternoon ceremony at the First Baptist Church. 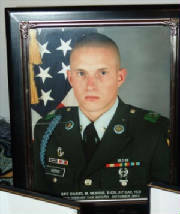 Daniel's mother, Amy Morris, said he had served seven years in the Army and one tour in Iraq when he told family members he would not reenlist. Instead, he planned to attend Bible College in the state of Washington and become a minister. A couple of weeks later, Amy said she received a call from Daniel to say he had a change of heart and reenlisted for four years with the U.S. Army. Among the speakers at the event was First Sergeant Michael Davenport, one of Morris' fellow soldiers in the 1st Cavalry Division. "I was in the vehicle directly behind Daniel when the I.E.D. exploded," said Davenport. "This kind of closes out one little piece for me to actually get to see the final bust [of Daniel] and talk to the family." Amy Morris said the event's success made her feel more at ease with Daniel's death. "I'd like to see the other fallen soldiers do the same thing in their communities because I think it really is an honor," said Amy Morris. A video is included in the original WBIR story Original story is here. CLINTON - Army Staff Sgt. Daniel Morris will soon forever stand guard next to the Anderson County Courthouse. 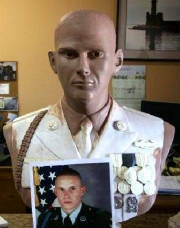 A bronze bust of the Clinton soldier killed two years ago in Iraq will be unveiled in ceremonies Sunday. 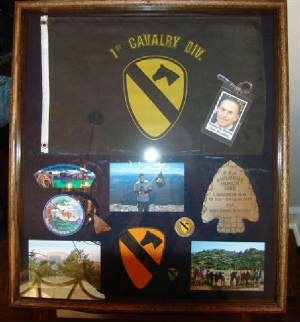 Morris died Nov. 25, 2006, when a roadside bomb exploded next to his Humvee in the Iraq province of Diyala. The Clinton native was 28 and had just re-enlisted for a second tour of duty in Iraq. He had planned to become a minister when he finished military service. U.S. Rep. John J. Duncan Jr., R-Tenn., will be the keynote speaker for the 2 p.m. ceremony Sunday in the sanctuary of First Baptist Church, Main Street. The life-sized bust of Morris will be placed on a pedestal next to the courthouse. 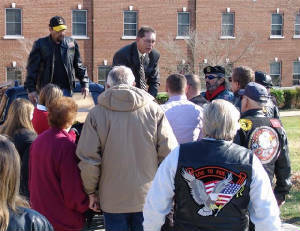 It will be the first lasting memorial in Anderson County to those who have lost their lives in the wars in Iraq and Afghanistan. It's also the first tribute in East Tennessee to a fallen soldier by a national nonprofit formed to honor those killed in the wars. 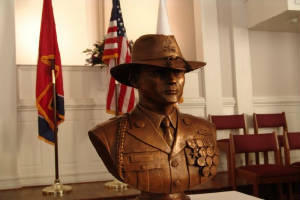 Operation Never Forget has the ambitious goal of funding bronze busts of the more than 4,300 military personnel who have died in the conflicts. "We want to make sure none of these people are ever forgotten," said Whitney Rogers. The Maryville native and Morris were cousins. 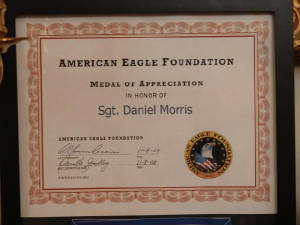 She is employed at Arnold Air Force Base in Tullahoma, Tenn. She joined Operation Never Forget last November before there were plans for a bust in tribute to Morris. "I feel that, if somebody is putting their life on the line for me and my freedom, the least I can do is give back to them," she said. Rogers said each bust, done by a Salt Lake City firm, costs $5,000. Clinton-area residents raised more than $6,000 during a radio-thon last July, she said. The extra money will go to help pay for future busts, Rogers said. She said Morris' mother, Amy Morris, e-mailed advice to the sculptor as the bust was being created. 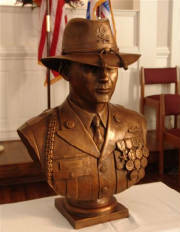 The bust will include a Stetson, Rogers said, "because he (Morris) was in the cavalry." 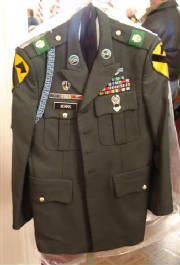 Morris was a member of the Army's 1st Cavalry Division based at Fort Hood, Texas. Bob Fowler, News Sentinel Original story is here. As I spoke, I had to choke back emotion...it was hard to follow "God Bless The USA" when we're singing it for your best friend. Bobby is a pastor, father, husband and church planter. Bobby is the lead pastor of The Ridge Community Church in Oak Ridge Tennessee. 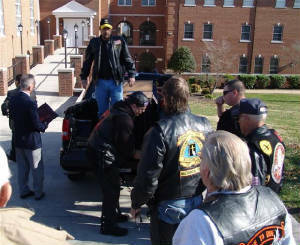 ET Patriot Riders carry the still unveiled statue of Daniel into the Church. ForeverRemember.org is a non-profit and non-political site. It is a "living memorial" in appreciation of the families who made the ultimate sacrifice for all of us. "Forever Young" is our way of expressing our recognition of that sacrifice. The song and video are downloadable for free and should be shared with anyone who has ever lost someone too soon. Our mission is to create a personalized DVD of the video for every fallen soldier's family that wishes to have one. 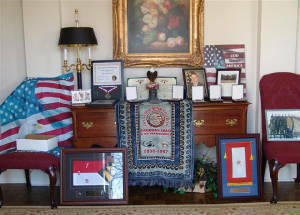 Please contact us if you wish to receive a free personalized video of your fallen soldier on DVD. Help honor our fallen soldiers. Visit Operation Never Forget to learn how. 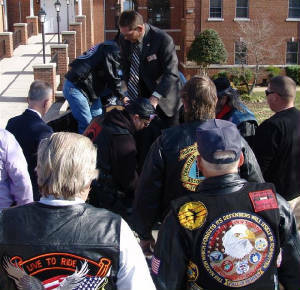 The East Tennessee Patriot Riders were honored to be at the unveiling ceremony and offer their assistance to Daniel's family. Duane Romaine, who provided most of the photos on this page said, "It was a very touching day." 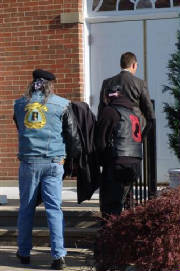 Many of them, including Duane, rode in Daniel's honor two years earlier at his funeral. 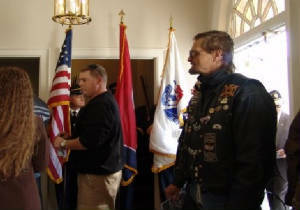 Duane is also a member of the CMA, Knoxville Chapter. OPERATION NEVER FORGET - whose mission and dedication is to building portraiture memorial busts of every service member whose been killed in theatre in Iraq and Afghanistan. The heroes of our nation who have answered our country's call, fought a good fight and whose lives have been cut short by making the ultimate sacrifice. Shall they never be forgotten…or just a name on a wall.